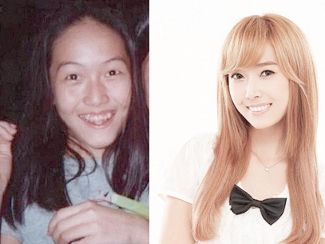 I think she has one of the most dramatic transformations in K-Pop. It's amazing. What procedures did she have ? Ohmygoodness she is just gorgeous. Personally I don't think she had any work done on her eyes (e.g. aegyo sal - she already seems to have that in the 'before' picture) so maybe just rhinoplasty to make her nose slimmer and jawbone reduction surgery? I really want to know which clinic she went to! I'm sorry but this is not natural aging haha. This is definite eye surgery (her eyelid looks completely different), double jaw surgery (like half of her jaw is gone), and rhinoplasty. Very obvious rhinoplasty. Her nose looks like a ski jump (a pretty ski jump). Also, keep in mind that most of her job is being pretty so I'm sure that a lot of money and time has been invested in her face. Korea beauty is really different. In your opinion, how does the idea of 'beauty' over there compare to the Korean ideal? ?